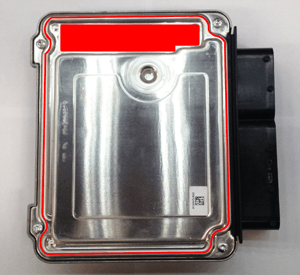 Before Removing the ECU, Make sure your vehicle is in a safe location where it may sit. Be sure to leave the vehicle in park, or in gear, with the emergency brake on. 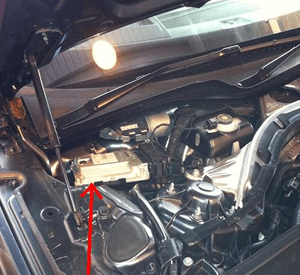 Turn of the vehicle before proceeding to remove the key from the ignition. 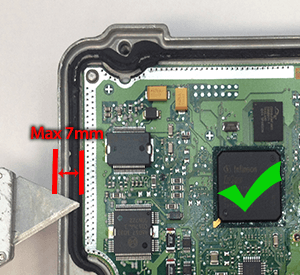 It is recommended to disconnect the battery and to not reconnect it until the ECU is fully reinstalled. Also do not put the key into the ignition or attempt to start the car until the ECU’s back in the car. 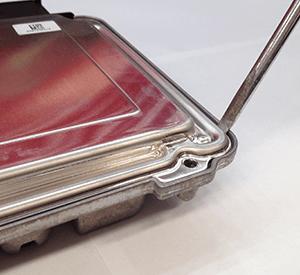 Make sure you discharge any static electricity before handling the ECU and take care when handling the ECU. 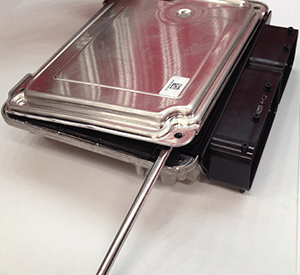 Make sure the ECU is not subjected to extreme heat or cold, magnets, electrical surge, physical shock or liquids. 1. 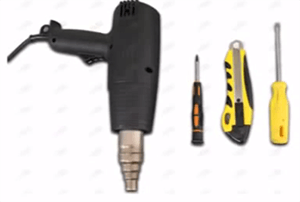 Remove all screws the hold the ECU together using the torque screwdriver. 2. 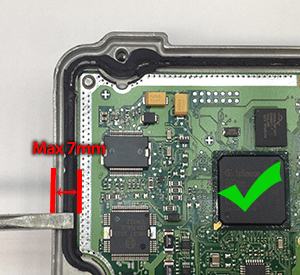 If required apply the heat gun to the perimeter of the ECU to heat the glue that secures the lid (Red Line). Be careful not to overheat the case or the plastic connector block! 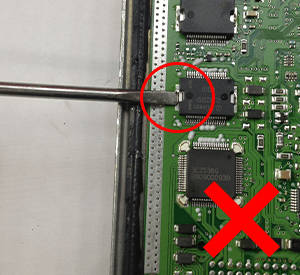 Do not penetrate the ECU by more than 7mm. Doing so could damage the board or components. 3. 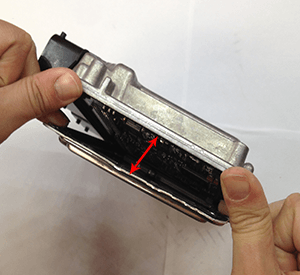 Carefully use a flat headed screw driver to prise the ECU open starting from the position shown below. 4. 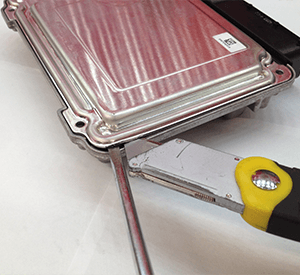 Use the blade to cut through the sealant holding the ECU lid to the case. 5. Using the two flat headed screw drivers, work your way along the top edge using the blade to cut through the sealant as you go along. 6. Once the top edge has been fully separated. 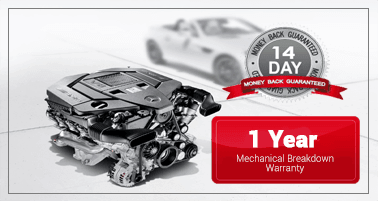 Repeat the same process on the near edge, ensuring again that you penetrate the ECU by no more than 7mm. 7. 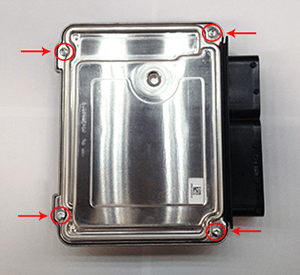 Once the top and near edges have been separated, then using the flat headed screw drive, prise the ECU lid away from the connection block as shown below. 8. The bottom edge has been left until last due to the large amount of sealant applied to the flat bevel section of the ECU. With three of the four edges now released, use your hands to prise away the lid from the remaining edge. Be sure to apply firm steady pressure and not strenuous short bursts. 9. 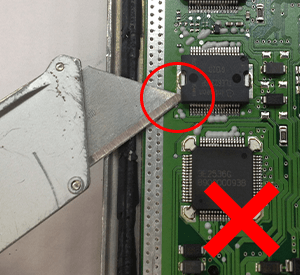 With the final remaining sealant, lift the ECU case lid and run the blade along the edge separating the ECU lid completely from the ECU. 10. 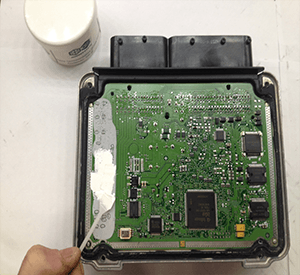 Before carrying out any further work, inspect the ECU board for any visual damage and reconnect to the car with case reattached to ensure the vehicle still starts. 1. After you have finished loading the software into the ECU. 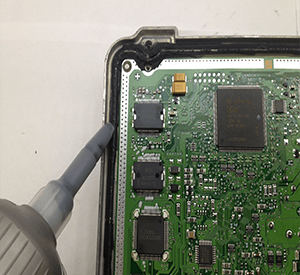 Take the thermal paste and apply to the section demonstrated below. 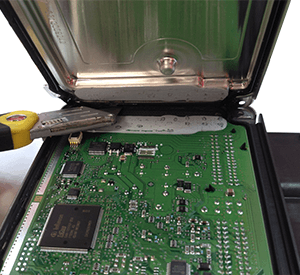 The thermal paste helps dissipate heat away from the ECU board. 2. 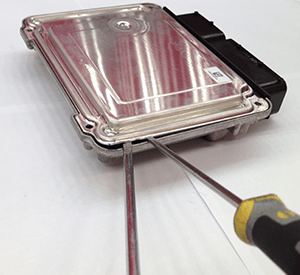 Apply a thin bead of sealant around the metal exterior rim of the ECU. 3. 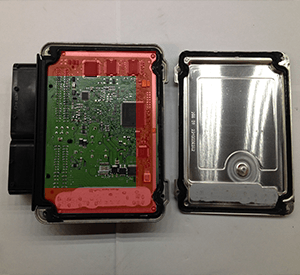 Place the ECU lid back on to the ECU and screw down all screws. Once sealed ensure all edges are closed and any excess sealant wiped away. 4. 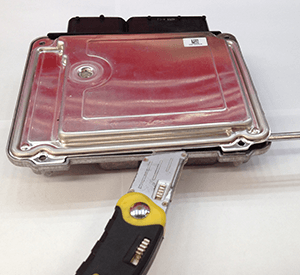 Reconnect the ECU to the vehicle and ensure it starts.